Summer sure feels like its here, or at least very very close. I rummaged through my shoes the other day to find my flip flops. Sure felt great to expose those white little toes to some of that sunshiney goodness. Get out there Tofino and embrace it while you can. West Coasters make the best volunteers and we want you! After 10 great years full of community support and great volunteers we prepare to do it all over again. On Sunday June 14, 2009, we are looking forward to showcasing our great community volunteers. We are looking for close to 300 volunteers to make our 10th Annual Edge to Edge Marathon the biggest and best year yet! Some of the volunteer positions available include: Traffic Control Marshalls, Aid Station Attendants, Registration/Package pick-up staff, First Aid Personnel, Radio Communications, Musicians on Course (sing or play an instrument? ), Massage Therapist. Once a year the folks of Clayoquot Island Preserve extend a very special invitation to the people of this sound. It is the weekend that they open up their island to visitors. It's a very special experience to get to spend an afternoon wandering the beaches, forest boardwalks and the extensive gardens of this 25-acre jewel. The island is a fantastic example of how people can live a life that is off the power grid and nourished by the land and sea. The island will be open to visitors on Saturday May 16 and Sunday May 17 from 12 - 6pm. Clayoquot Island aka. 'Stubbs' sits off of Tofino directly to the west by a mile or so. Boat transportation is provided free of charge from the 1st street government dock and from Method Marine. Come prepared for the boat ride, bring a picnic and please leave your pets at home. The Rip Curl Stew, a two-day judged surf contest will be held May 23 & 24 at Cox Bay. The surf comp will feature 7 categories - including open categories for men & women & children, allowing surfers at all levels & ages to showcase their talent! With the estimated number of competitors in attendance being close to one hundred, it is lining up to be an unforgettable weekend. Rip Curl & event sponsors will be giving out tons of great prizes all weekend. For the competitors, there will be $20,000 worth of cash prizes along with prize packs filled with amazing goods. First place for pro men's will receive $4500.00 & pro women's will receive $1500.00. Kathy Page is an acclaimed British author whose works include The Story of My Face and Alphabet. She has also written many short stories, which appear in her collection As In Music, as well as in numerous other short story collections and anthologies. Page will be in Tofino to give a public reading on May 28 and a fiction-writing workshop on May 29, with special focus on characters and dialogue. Enrolment to the workshop is strictly limited; for more info contact Jackie Windh by email at jwindh@hotmail.com, or phone: 250.725.2484. 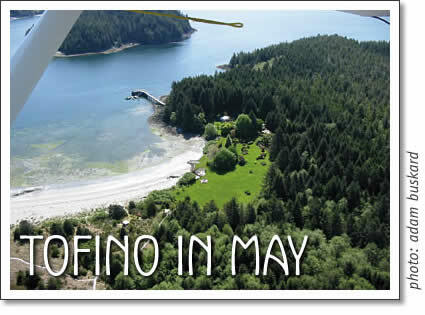 Tofino in May 2009: Overview of May events in Tofino, Clayoquot Island open house, Rip Curl Stew surf comp, Tofino Public market and other Tofino events.